Oh, have we got a fun time in store for (both of) you today on Saturday Morning Hangover. We will, as ever, start the show off with the latest batch of Xbox Live Indie Games demos and there are a few to look forward to. An iOS bullet hell game with changing objectives, Pig & Bullet, cropped up this week and I suspect you'll want to tune in early to catch Aqualibrium, a 2D platformer set in a flooding ship. That one has potential. But then, what wonders we'll see! While rooting through my shelves the other week, I came across a copy of Apocalypse. It's the game that first forged a relationship between Neversoft and Activision, just prior to the pair dropping the Tony Hawk bomb on everyone. 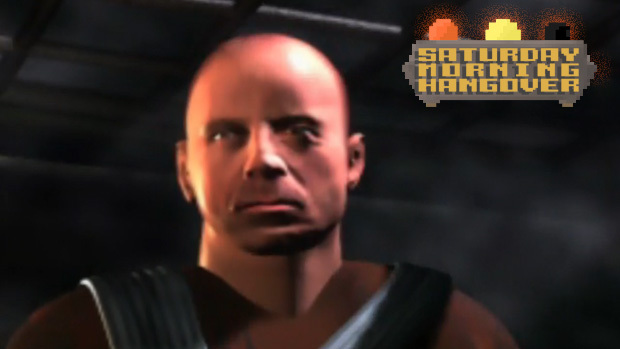 Apocalypse is a platforming shooter starring Bruce Willis as a wisecracking nanotechnology researcher fighting against a scientist called "The Reverend" and his artificially created "Four Horsemen" before they can destroy the world. The fact that such a game exists at all is nearly beyond comprehension. I can't wait to share it with you. Come join us over on Dtoid.tv!